Learning to Live a Healthy Life! Unlike the highly touted flu shot, black elderberry has actually been conclusively proven to be effective. It is one of the few natural remedies that has been written up in the medical journals. The studies I’m listing here are based on black elderberry extract (Sambucus nigra L) - name brand Sambucol. Dark Chocolate Good For You. Should Eat It Daily. The Food and Nutrition Information Center - a leader in food and human nutrition information dissemination since 1971 - provides credible, accurate, and practical resources for nutrition and health professionals, educators, government personnel and consumers. Learn more about FNIC. Fast Food May Sink Children's Grades? 1) Irritable lungs. For example, when I breath in alcohol vapors I need to cough. When I drink my coffee in the morning I need to cough (probably a reaction to the caffeine). 2) Sensation in the teeth. I feel my teeth. I can’t decide if this is good or bad. What is definitely bad is that when I switch from warm food to a cool drink I get nasty electric shocks in my teeth. Rarely I have experienced tooth-ache like pain as a result of chilling my teeth with cold air or cold food. This pain lasts for 10 or fifteen minutes. 3) Bone pain in the fourth finger on my left hand. This is very strange. Often within minutes of taking a vitamin D supplement, I notice a slight pain in the fourth finger of my left hand and nowhere else. I first experienced this feeling while taking 4000 IU/day and, at that dose, the pain got quite severe on the last day I took that dose. 6) Chest pain and heart sensations. I find this to be the worst and most alarming side effect. It caused me to shun all forms of vitamin D for two months. I went for a full cardiac workout and blood testing. I was informed that I’m in terrific health. Like the bone pain, for me this side effect is more severe from supplements than from sunshine. 7) Insomnia. Vitamin D will make me fatigued during the day while at the same time it sometimes causes me to wake up near 4 am in the morning. I have alot of trouble falling back to sleep and sometimes get up between 5 and 6 instead of between 6:30 and 7:00. 8) A bad mood. Vitamin D is known to have psychological effects. It is supposed to improve mood. I’m really uncomfortable with listing this as a side effect because it is so subjective. The other side effects are sufficient to put me in a bad mood. But my gut tells me it is worse than that and that the excess vitamin D is actually causing a feeling of doom. As time passes, I've become aware of more reports of feelings of doom. Obese people can gain extra years of life after weight-loss surgery – halving their risk of dying early from any cause. Dramatic new evidence shows bariatric surgery – giving people procedures such as gastric bands – can improve long-term survival for patients from any age group. Researchers say it works by cutting diabetes and other obesity-related conditions including heart problems. 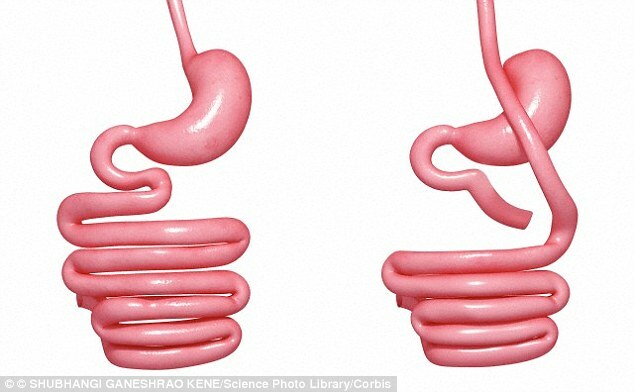 Weight loss surgery includes gastric band surgery and gastric bypass (the stomach and intestines are pictured before, left, and after, right, the procedure). It can halve the risk of dying early from any cause It has also become safer in recent years, according to a study in the Journal of the American Medical Association. The study found obese people had a 53 per cent lower risk of dying from any cause at five to 14 years after weight-loss surgery. The study involved 2,500 obese patients and nearly 7,500 matched control receiving care at medical centres in the US Department of Veterans Affairs (VA) health system. Study leader Dr David Arterburn, of the Seattle-based Group Health Research Institute, said ‘We have tracked a large group of patients for a long enough time that we can clearly see a strong link between bariatric surgery and long-term survival. If you can’t stomach vegetables there is a surprising - and all natural -solution. 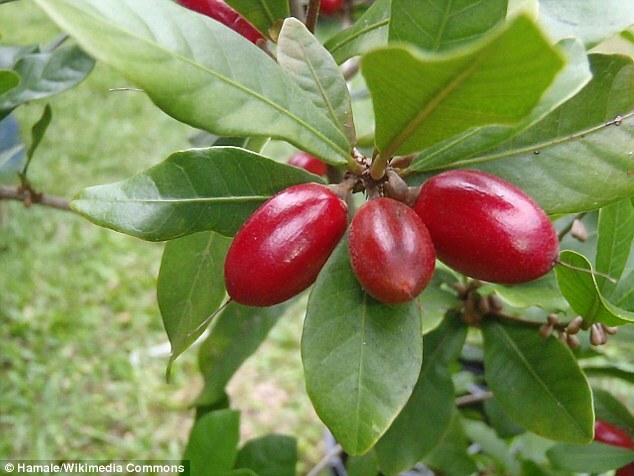 Known as the Miracle Berry, this jellybean-shaped fruit can make sour and bitter foods taste sweet - and the sensation lasts for up to two hours after eating. The fruit contains a protein called miraculin that binds to the taste buds on the tongue and ‘trips’ flavors to appear sweeter. Fexaramine sends out the same signals that normally happen when you eat a lot of food, so the body starts clearing out space to store it, say the Californian scientists behind the research. The pill tricks the body into thinking it has consumed a large amount of calories - as if you have just eaten a substantial meal. The Centers for Disease Control and Prevention has announced that the flu vaccine isn't a good match for this year's strain. So, even more people than ever can expect the fever, chills, aches, nausea, and other symptoms associated with influenaza. What can you do? The CDC recommends taking an antiviral such as Tamiflu or Relenza to reduce the flu's duration. Not so fast, says holistic physician Dr. David Brownstein. "Forget it," he tells Newsmax Health. "It doesn't work, it's expensive, and it has side effects. "Tamiflu is the most commonly prescribed antiviral medication for treating the symptoms of the flu," he says. "Less than a day?" he asks in amazement. "And that's only when it's given within 48 hours of contracting the flu. Honestly, I can't make this stuff up." "Tamiflu costs approximately $120 for a full course of treatment," says Dr. Brownstein. "It's a waste of your hard-earned money. "Not only does Tamiflu fail to treat the flu, it is also associated with a host of adverse effects including nausea, vomiting, diarrhea, headache, and abdominal pain. "Wait a minute," he says. "I thought those were the symptoms of the flu! Tamiflu has also been associated with more severe side effects such as hepatitis, anaphylaxis, cardiac arrhythmias, seizures, and dangerous neuropsychiatric side effects such as hallucinations and suicide. "Honestly, do you think all those side effects are worth it to reduce the severity of the flu by 21 hours?" Ibuprofen adds 12 years to life! Regular doses of ibuprofen could allow people to live up to 12 years longer. In tests, the drug appears to hold back the ageing process as well as helping fight disease. Ibuprofen, which is used every day at home by people to treat inflammation, pain and fever, may be the key to developing a long sought after anti-ageing drug. Dr Brian Kennedy, president and chief executive of the Buck Institute for Research on Ageing in California, said: “There is a lot to be excited about. "The research shows that ibuprofen impacts a process not yet implicated in ageing, giving us a new way to study and understand the ageing process. “Ibuprofen is a relatively safe drug, found in most people’s medicine cabinets. Lead researcher Professor Michael Polymenis of Texas A&M University agreed. Is All Foods Fit to Eat? The Plain Truth. Picture Window theme. Powered by Blogger.